Me: Nani, Is there any difference between Dharma and Religion? Or are they same? Nani: Yes there is, there is big difference between dharma and religion? But why are you asking that? 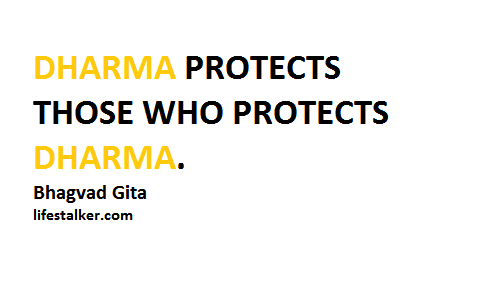 Me: Because one day you have said, "Dharma protects those who protect dharma, not religion, so follow the dharma not religion". Nani: Ok, Do you really want to know? Nani: Dharma is not same as religion. Though word "Dharma" is Hindi substitute for word "Religion", but in true sense, Dharma is much more than Religion. Religion is something with set of rules and obligations of one society and you ought to follow them, and even if you feel they are wrong for society, you need to be abide with these set of rules and obligations. But Dharma is free. Dharma is righteousness. Dharma is humanity. Dharma is not one religion but Dharma is a universal law, which surpasses all religions. So if there is anything wrong according to Religion, but if it is in the favor of humanity, it is righteous, then it is Dharma. Dharma is a simple thing, just to follow the path of righteousness, and you will find yourself, and find the supreme one. And religion is path of confusion, which only make you more confuse about his and your existence. So follow the Dharma, follow yourself, not religion. Now, have you got it? But Dharma is free. Dharma is righteousness. Dharma is humanity. Dharma is not one religion but Dharma is a universal law, which surpasses all religions. So if there is anything wrong according to Religion, but if it is in the favor of humanity, it is righteous, then it is Dharma.nice teaching from your grand parents (nani ) .